Francis Sydney Muschamp was elected a member of the Royal Society of British Artists (RBA) in 1893. 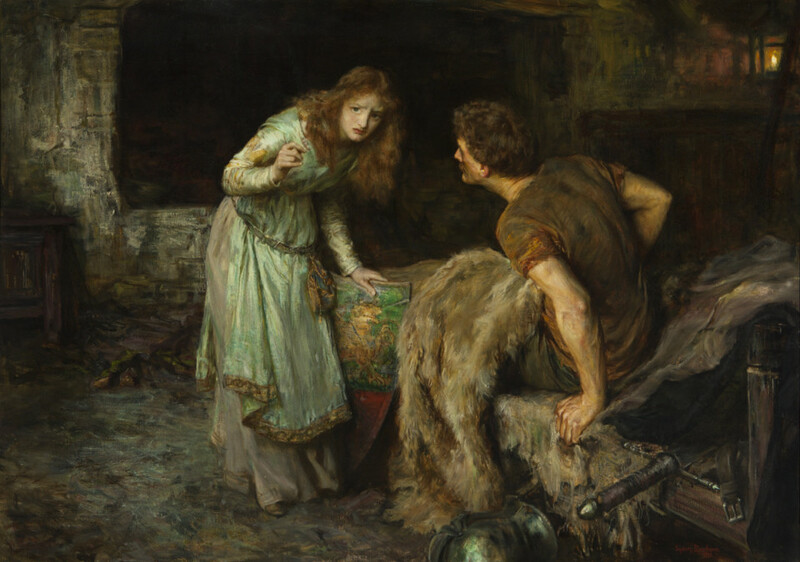 Enid – Then breaking his Command of Silence …, exhibited at the Royal Academy in 1895, brings to life a scene from the romantic legend of King Arthur, retold in Tennyson’s Idylls of the King. Enid is a humble maiden who desperately loves her husband, Geraint, one of Arthur’s bravest knights. Geraint doubts his wife’s loyalty and forbids her to speak on his journey to fame and fortune. Here we see Enid reluctantly breaking her husband’s command of silence to warn him of an evil plot by her former suitor.